The team struggles to find a kidnapped Patterson in "Mans Telepathic Loyal Lookouts," but it's really Jane who is getting lost. David organized a tattoo scavenger hunt for Patterson on their one-year anniversary because he's the cutest cupcake who ever lived. Patterson diligently hunts down every clue. She climbs a fire escape to break into David's apartment and almost breaks her neck in the process. I wasn't making any comparisons between Jane and Patterson prior to this, but Blindspot really wanted to make it clear Patterson lacks Jane's athletic skills. I am, however, growing rapidly concerned about what board games Patterson and David played. What kind of board game requires cooking sheep in a fireplace? "I'm A Serial Killer. Ask Me How?" Maybe play Charades instead, kids. The next clue leads Patterson to an automaton and David officially became creepy. Then, the psychotic robot stabs out a constellation for Patterson and David is back to being the cutest ever. The constellation leads to the star Aldebaran, which is also the name of a store. Seriously, who makes up these tattoos? Is Martin Gero a walking encyclopedia of random factoids and decided to make a TV show out of it? All signs points to yes. Remember my rule? If there's a well-known character actor playing a role on Blindspot, then he or she is a bad guy. The minute Owen Lyman opened the door, I wrote in my notes, "BAD GUY. RUN PATTERSON RUN." Of course, she didn't, and instead sits down to have a cup of tea. No Patterson, you do not want tea. Put the Darjeeling down! Characters on TV shows really need to start listening to me. They would all be married with babies and never in any trouble. It turns out that Owen is a serial killer, so the sheep board game is starting to make a lot more sense. He's also the brother of a state senator. Ding ding ding! There's the government connection we've all been waiting for. A pharmaceutical company covered up all of Owen's murders as long as his brother, the senator, voted in their favor. Next week, an insurance company will dabble in the occult. Stay tuned! Team Blindspot discovers Patterson is in trouble quite quickly because she never misses work. My husband would be more concerned about my safety if I missed Blindspot or Arrow as opposed to work, but everyone has their priorities. Weller so efficiently states, "Find the tattoo. Find Patterson." That's great Kurt, but you need Patterson to find Patterson. Jane: Can't we hack in? Zappata: We could. ... if Patterson was here. See? ZAPPATA KNOWS. I'll admit that Blindspot had me fooled. As the team swept through the store and Patterson struggled to get free, I thought they'd find each other. 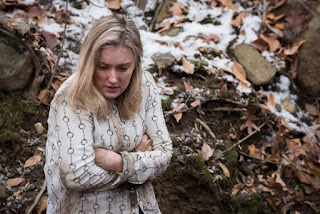 When Patterson escapes and finds herself in open woods, my stomach dropped. I thought, "Oh God. He moved her." Just jump straight into my nightmare, Blindspot. Team Blindspot knows Patterson is a precious unicorn and must be protected at all costs. As Kurt and Jane search the woods screaming Patterson's name, my heart soared. The best, of course, is Patterson saving Jane from the serial killer and not the other way around. That's my girl! I teared up as Jane covered up a freezing Patterson, completely relieved she is safe. Now don't ever do that again, Blindspot! Her hallucination of David serves as both humorous scene partner and emotional support who steels Patterson's will to survive. Her kidnapping is a physical manifestation of Patterson's emotional trauma. For so long she's been lost; but now, finally Patterson seems to have found her footing again. She is able to say goodbye to David. Her tattoo search almost got her killed, but was ultimately therapeutic in a nature. A therapy session, however, would have been far less stressful on my heart. After Sara pays Reade another visit, because she's a glutton for punishment, he receives another threat. Every time Reade answers the phone, I feel like I'm watching Scream. Instead of interfering Mayfair's investigation as "Ghostface" requests, Reade comes clean to Mayfair. I just about fell out of my chair. Someone on Blindspot communicating honestly? But that can't happen! There will be no show! Thank goodness we have Zappata to depend on. She agrees to spy on Mayfair for Assistant U.S. Attorney Mathew Weitz, on the condition that none of her teammates will be targeted. She's referring to Reade and his super-secret spy meetings with Mayfair. Weitz agrees, so it'll be fun to see how this all blows up in Zappata's face. A support group would really be a lot less trouble. Not for nothing, Weitz is kind of cute. As long as he's ruining Zappata's life, he could at least buy her dinner. No? Just me. Okay. All right show. That's enough. You know what? I'm spending way too much time focusing on Oscar and Jane's sexual encounter. No thank you. Don't get me wrong: I like Oscar. I think he's a great guy. He remembers Jane's favorite Chinese food. They even have a song and Oscar asks Jane to dance. That's cute Oscar, but she's still going to have Kurt Weller's babies. Facts are facts, my friend. What's most enlightening is Oscar's description of the person Jane was before: compassionate, loyal, patient, and stubborn. Yup, that's our Jane. I find it interesting the person she was before and the person she is now share the same attributes. It's the age-old nature versus nurturer debate and it seems Blindspot is landing squarely on "nature." The first descriptor which came to Oscar's mind is "compassionate," and I agree. Compassion is Jane's greatest strength; however, it can be her greatest weakness if used against her. Oscar wants Jane to pretend to remember her childhood with Kurt Weller in order to get close to him. Since Kurt's father is in the hospital now, Kurt will be feeling vulnerable and sad. Jane's sudden memories could be just the thing to cheer Kurt up. It will also pull him away from Allison and closer to Jane, which is what Oscar wants. The problem is... Jane's compassion won't be false. She will want to be there for Kurt. Oscar's request twists who Jane innately is into someone she's innately not. Jane has been lost without her memories. But the truth is, she's not as lost as she believes. Who Jane is hasn't really changed. The challenge is to not let the mission change her. The more she searches for answers, and the closer to Oscar she gets, the more lost Jane becomes. Sawyer is playing a gallbladder. What school does he attend? Future General Surgeons of America? Sawyer really wears that gallbladder costume, at dinner no less. Kid is awesome. He can stay. "I mean... this is a little fun." WHY DID DAVID HAVE TO DIE? He's the cutest. I hate you, show. That was an extremely elaborate way for Patterson to break her cell phone. "Oh there's a PowerPoint." Zappata's sass is on point tonight. "I didn't know it was going to lead to Buffalo Bill up there." The mere mention of Buffalo Bill requires a Disney movie marathon to purge the memories of Silence of the Lambs. "What? I like stars and I was very unpopular in high school." Patterson wins the episode, but Zappata is a close second. Reade's first name is Edgar. Heeeee. I'm gonna call him Ed. I'm going to assume there aren't any tattoos in those blurred out... areas. If not, then we're talking about a different kind of show and it's one that should be on STARZ. does anyone know what the board game [roasting sheep] is?